Shorter lead times and the need to turn product faster have driven the leadership at Sure Tool & Engineering Co., Franklin Park, IL, to invest mightily in new sheetmetal-fabrication technology—laser cutting, CNC punching, electric press-brake forming, and resistance and arc welding. While company vice president Julian Burnley and director of operations Tim Berger are quick to point out that the company’s once-shrinking stamping operations have rebounded nicely in recent years, it’s the flexibility and quick response it can achieve with fabrication that fuel its ability to satisfy customer requirements. Specifically, laser cutting, CNC punching and press-brake forming enable the firm to efficiently produce small lot sizes of parts and meet lead times as tight as a couple of weeks or less. 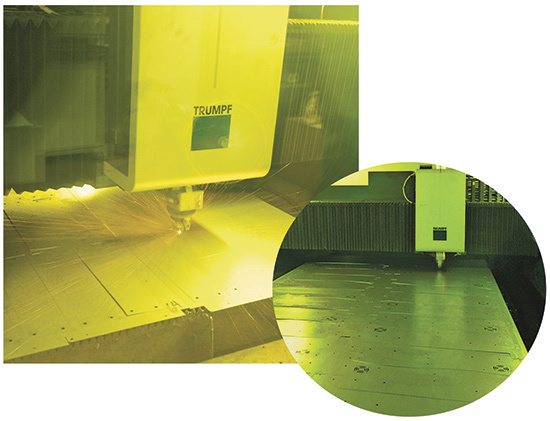 In December 2013, Sure added this Trumpf TruLaser 5030 5-kW solid-state laser-cutting machine to its stable, in part to allow it to take on thicker work and expand into new markets. …accelerated in 1999 with a 15-station CNC punching cell, followed two years later by a second punching cell with automatic load/unload, and in 2005 by a third CNC punching cell that includes the ability to form flanges to 3 in. and tap threads in sheetmetal to ¼ in. thick. Fast forward to December 2013 and Berger boasts of the firm’s newest acquisition: a Trumpf TruLaser 5030 5-kW solid-state laser-cutting machine with fiberoptic beam delivery, the first such machine equipped with Trumpf’s BrightLine fiber technology (introduced to the North American market at FABTECH 2013 in Chicago). The new machine, explains Berger, nicknamed Helena (Sure employees assign names to all of the firm’s fabrication equipment), cuts 7-gauge cold-rolled steel at 244 in./min., significantly faster than its previous-generation 3-kW solid-state laser-cutting machine (dubbed Sabine). Also on the production floor is an 11-yr.-old 2500-W five-axis CO2 laser-cutting machine, used for 3D cutting. Equipped with Trumpf’s BrightLine fiber technology, the newest laser-cutting machine at Sure has delivered huge improvements in cut-edge quality—“no discernable burring or slag, and minimal surface roughness on the cut edges,” says plant manager Carlos Rivera. “We brought in Sabine and then Helena to cut faster and also to accommodate thicker material,” Berger says. “Prior to that, we were outsourcing work thicker than 3⁄8 in. to local plasma-cutting shops. With the newest Trumpf machine, we no longer have to do that. And, since we now can laser-cut steel to 1.0 in. thick, we’ve been able to quote more work outside the POP industry, which has allowed us to earn work for the snow-removal industry and others. That equipment-investment portfolio represents well the significant growth Sure has experienced, from a $1.5 million company in the late 1990s to $17 million in 2013. It expanded from its original 10,000-sq.-ft. facility to a 41,000-sq.-ft. building in 1996, and again in 2006 to its current 82,000-sq.-ft. plant—soon to be joined by an additional 64,000-sq.-ft. building to house assembly and packaging operations. Another testament to the firm’s growth: Its recent need to laser-cut lights-out, unmanned on a short third shift. Sure Tool vp of engineering Carlos Rivera explains. Other than Cutting Speed, What Else Matters? We posed that question to Rivera, who—as expected—had no problem coming up with an answer. “Edge quality is critical to our applications,” says Rivera, noting that the firm cuts everything except for very thick work with nitrogen, to enhance adherence of the powder coating. Enter Trumpf’s BrightLine technology, developed to enable the cutting of thicker material with the solid-state process, typically reserved for thinner sheetmetal. For example, while the TruLaser 5030 solid-state system previously was rated for cutting 20-mm stainless steel and 25-mm mild steel, the machine could not process higher-strength materials at the same level of quality that a CO2 laser could. Fabricators might wind up with uneven cut surfaces and edge burrs. BrightLine—new technology that according to Trumpf literature accelerates the cutting gas to a high velocity, and provides customized process parameters—eliminates those concerns. Rivera concurs. What About the Narrow Kerf from Solid-State Cutting? Rivera offers a good answer to this question, as well—one that often comes up when discussing and comparing solid-state laser cutting (using either fiber lasers or Trumpf’s TruDisk solid-state technology) with CO2 laser cutting. Bottom line: the narrower kerf from the solid-state laser beam can impede cutting of thicker material, including making it difficult to extract cut parts from the skeleton. Not so with the BrightLine feature, says Rivera.